Sony’s new “Elevated Standard” (ES) line of AV receivers and Blu-ray player represent the company’s top-of-the-line 3D-ready video equipment – but will only be available to custom installers and select AV retailers. On a more user-friendly note, iPhone & iTouch users will be able to control the new models using a free mobile app – featuring zone control, a full GUI menu, and Sony’s Quick Click remote function. 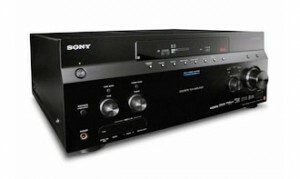 The new Sony hardware includes the STR-DA5600ES, STRA-DA4600ES, and STR-DA3600ES AV receivers and BDP-S1700ES 3D Blu-ray player. The new ES AV receivers feature IR input jacks, two-way serial control, and control over IP allowing integration into home automation systems such as Control4, Crestron, AMX, Savant, and Ultimate Remote Control. The 7.1 channel DA5600ES will pump 130 watts x7 @ 8-ohms, with 3D passthrough and integrated four port ethernet switch and will retail for approximately $2,000. The 7.1 channel DA4600ES ($1,500) and DA3600ES ($1,100) will push 120 watts x7 and 100 watts x7, respectively. Both units will also come with 3D passthrough and integrated four port ethernet switch. The BDP-S1700ES Blu-ray 3D player, with built-in WiFi, 1GB memory, DLNA Client, and Dolby TrueHD and dts HD Enhanced audio codecs will be available next month (Aug. 2010) for about $400. “Because Sony is involved in every stage of the 3D ecosystem, specialty dealers and installers can rest assured that our AV components leverage that deep expertise to deliver the most technically advanced experience possible,” said Brian Siegel, vice president of Sony’s home audio and video business. Sony ES products are supported by a five-year limited manufacturer warranty, a ninety-day advanced exchange program (2-3 day expedited replacement unit), and a dedicated installer support line to San Diego-based CEDIA trained product experts. For full details on the ES series check out Sony’s press release. Wait a minute, “3D passthrough” is required to watch 3D content through a receiver?? Between a new receiver and $150/pair of glasses, I get the feeling they don’t really want this 3D thing to catch on at all.